If you are a runner in Baton Rouge, then you’ve most likely attended the Happy’s 5000 road race as it draws close to 1000 runners. Being a night race downtown on the weekend, it ends up being more of a run to start off the party than a run that starts off the day in the morning. Great food, lots of drinks, good people, live music all help create a great vibe and made it the perfect place to celebrate my Crutches to 5K completion! Not going to give you the play by play as it basically goes like this…I ran 3 miles and walked one x 12ish times. That’s how I run now and probably will for the foreseeable future. But the good news is, many a person has finished a marathon and Ironman with that strategy. I did break 40 minutes, which right now is pretty amazing to me. Thanks to all who came out to celebrate with me including my FJR teammates, some friends from BRPT Lake and my peeps from BRTri–y’all rock! 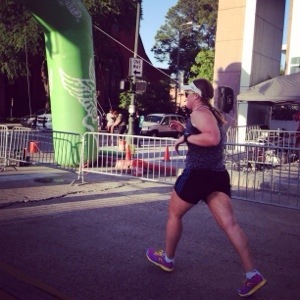 Next stop on the Koko Comeback Tour: Louisiana Triathlon this Saturday! Love this pic, bc it shows my scar on the inside of my right knee.